Victorian Sash Windows Ltd - Windows/Doors/Conservatories based in Gartcosh, North Lanarkshire. With more than 20 years of experience we are able to find the best solutions for your repairs, restoration or painting and pointing work Victorian Sash Windows Ltd is a family company. We provide Sash Window Restoration and Repair’s in Glasgow and throughout Scotland. We pride ourselves in providing a friendly and professional service, and by running the administrative side of our business from home, we can provide cost effective prices too. Our work has been passed by Historic Scotland and is recommended by architects who we have worked alongside. Over the years we have built up a strong reputation throughout the local area for providing a high quality Sash window repair and restoration service in Glasgow matched with our excellent customer service. That’s why the majority of our work comes from good references from happy customers. 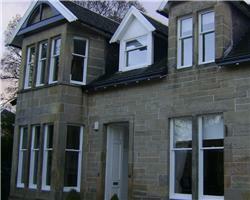 Victorian Sash Windows Ltd offer contract work for businesses throughout Scotland. If you would like a free survey please contact us. Steven Robertson himself carries out the survey, so you can be assured of friendly, experienced and practical advice, without the usual window company sales pressure.